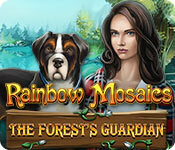 Rainbow Mosaics: The Forest's Guardian is rated 4.6 out of 5 by 9. Rated 5 out of 5 by mnkysmom from Great game, beautiful music This is a wonderful mosaic game. Colors are bright and offers a variety of styles. I like the penguins too, but can finish them up pretty quickly. This one, however, seems to go on and on! Yay! Multi color wheel and hints available with no penalty. Very lovely, relaxing game with an incredibly beautiful soundtrack. Highly recommend. 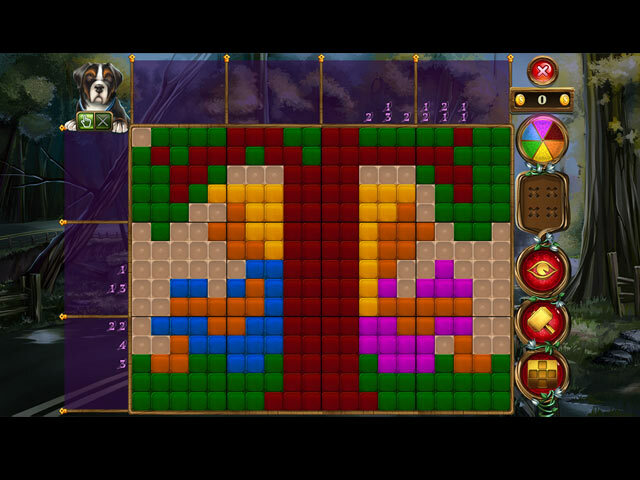 Rated 5 out of 5 by Teakapacem from Ingenious Mosaics Bought this game sight unseen and played over 40 levels when I realized how amazing the mosaics were. So I stopped to write this review. In the same 20x15 squares used by most of this type, Awigor has created the most unusual and entertaining mosaics. They are truly inventive and so colorful. Rated 5 out of 5 by kristidumplin from If you've never tried a game like this - try this one! It's perfect! Rainbow Mosaics is just the best!! Why, you ask? I'll tell you. To begin with, there is always a nifty story, and you don't get that a lot in mosaics or griddlers or nongrams, whatever you wish to call them. 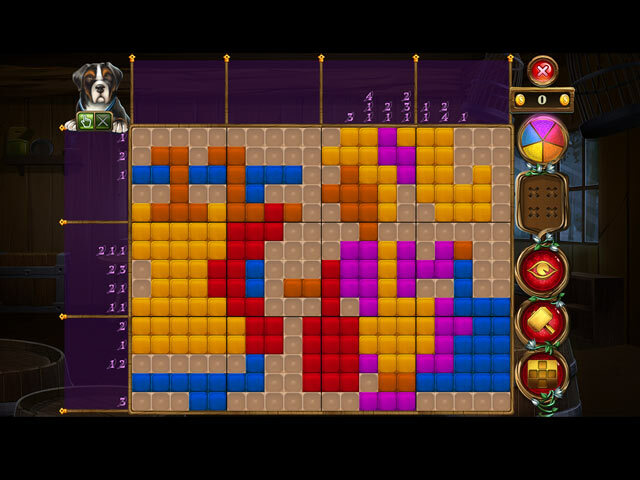 Next, you can choose from several different tile sets! I love the more dimensional ones, but they are all wonderful and the colors are bright and easy to see. Now -the puzzles themselves. Don't be fooled. The first few levels are pretty easy, but, be advised! They don't stay that easy! You are eased into the more difficult puzzles gradually and that is a great feature if someone is trying a game like this for the first time. When you work a puzzle, you get points/coins. Why do you need coins? There is a fun little store where you can buy all kinds of stuff for your forest cabin! I love that part of the Rainbow games - buying stuff! There is actually a use for the points/coins you accrue. There are also power-ups you can use to open a random square, open a selected square, or open a small section of tiles, and you can buy upgrades for them, too! Another thing I like - you make money fairly quickly so you aren't playing half the game before you get to go to the store. If you have never tried a mosaic, nonogram, griddler game, start with this one. You not only won't be disappointed, you'll be hooked! The great thing about being hooked - there are oodles and oodles of games like this on Big Fish, but, Rainbow is, in my opinion, one of the very, very best! Rated 5 out of 5 by Andovape from Another Good One I love mosaic/nonogram games, whether colorful or not, but the one thing that makes the game a no buy for me is if you have to guess to complete the puzzle. 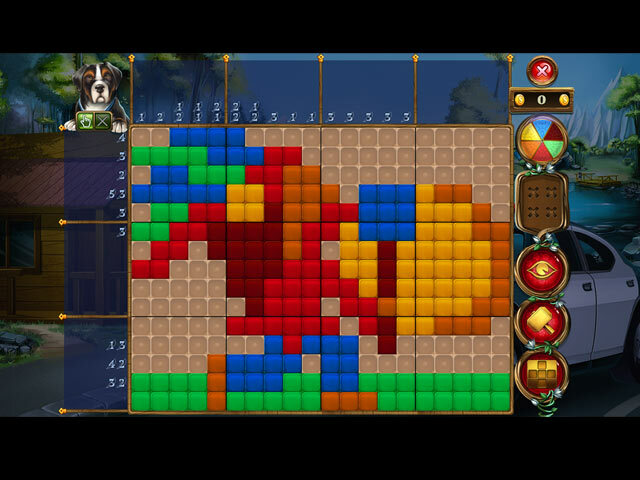 I have played each of the games in the Rainbow Mosaics series and have never had to guess to complete a puzzle. They can always be completed using logic. This series rates up there with the Gizmo and World Mosaics series. Since my goal is to finish the puzzle with no hints and no mistakes, I like the ability to start the puzzle over again without having to back all the way out. The menu in each puzzle has a restart button. The pictures are identifiable and labeled, and the colors are distinct. With 120 levels, the game takes a while to complete. It was an immediate buy for me. Rated 4 out of 5 by verimeri from almost a five star The only reason I gave this 4 stars is a lot of the pictures really don't look much like what the caption says it is. There were some I could not make out no matter how I looked at them. So almost as good as Fantasy Mosaics but not quite. Rated 3 out of 5 by rheashard2 from Not as good as previous mosaics of this series I have done all of the previous Rainbow Mosaics. This one was not as good. There were a lot of things wrong. The pictures weren't as good, translations were poor, storyline wasn't that good. I enjoyed the others enough to complete multiple times. I don't have any desire to do this one twice. I did the first few mosaics under the trial. I was disappointed. I then thought that easy mosaics were first to attract beginners. I should have followed my instincts and passed on this one. I had the feeling that this was a rush job, new designers or apathy. If I had done this one first there is little chance I would have done others of this series.